K.C.Das Commerce College Recruitment 2018 | Assistant Professor,Junior Asst. & Assistant Librarian Jobs : Good evening dear job aspirants. K.C. 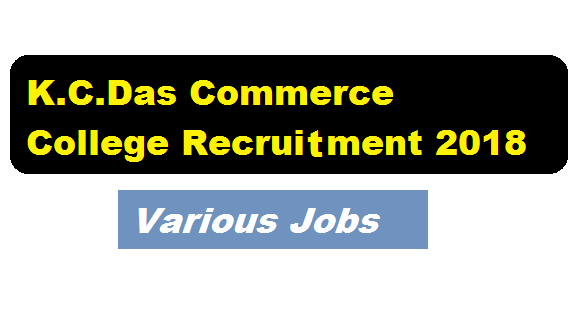 Das Commerce College has published a recruitment notification in the moth of July 2018. According to the latest K.C Das Commerce College Recruitment 2018 notification, Applications are invited with complete Bio-Data & supporting testimonials from HSLC onwards for various posts at K. C. Das Commerce College from prospective candidates against self-financing courses. In this section, we will discuss in detail about Recruitment of different Posts under K.C.Das Commerce College Recruitment 2018 with all the details and requirements. Educational Qualification : Candidates should be MBA (HR, Marketing) / M.Com. (HR, Marketing) and also able to teach economics). Educational Qualification : Candidates should be Graduate with computer knowledge. Candidates must have Diploma in Computer applications or other equivalent. Proficiency in Assamese DTP works desirable. Educational Qualification : M.L.Sc.. Knowledge of latest library related software desirable. Application should be sent/ submitted to the Principal & Secretary, K.C. Das Commerce College within 15 (fifteen) days from the date of publication of this advertisement [11th July 2018], along with a Demand Draft of Rs. 500/- (Rupees five hundred) only drawn in favour of Principal, K. C. Das Commerce College payable at Indian Bank, Athgaon Branch, Guwahati. 1/ Call letter for the interview will be issued to the eligible candidates in due course of time. 2/ No TA/DA will be paid to the Candidates called for the interview.